After a year’s hiatus, Dreamspeakers is back stronger and longer – and still with the goal of making the event even better for next year’s filmmakers and festival-goers alike. “We’re taking this opportunity this year of the festival to really connect with the local community,” said Christine Sokaymoh Frederick, who took over as executive director for Dreamspeakers International Indigenous Film Festival in February. Part of that connection is to get a better handle on how the Indigenous arts community in Alberta has changed. “We’re investing in the artists’ infrastructure. We’re having several workshops and panel discussions and community dialogues, surveys, and all of that is meant to help us basically create our strategic plan for the next three to five years,” she said. Input will allow Dreamspeakers to be responsive and “resonate” with the community. “When we look at the measures of the vitality of any community, access, inclusion recognition, appreciation, those are the four areas I look at as a community developer,” said Frederick. A tumultuous 2015 -- Sun and Moon Visionaries Aboriginal Artisan Society’s eviction from its downtown location had a “ripple effect” on the arts community; Frederick’s Alberta Aboriginal Arts, which produces the Rubaboo Arts Festival, was “going through some major issues” in securing stable funding; and Helen Calahasen stepped down as executive director for Dreamspeakers -- resulted in Dreamspeakers being cancelled. “Realizing there was such fluctuation and fragility in the Indigenous arts community in Edmonton and Alberta, we really needed to make sure we were reacting in a very responsive and hopefully profound way,” said Frederick. And the year off was time well-spent, she adds. “A lot of what we did in the early spring was really invest in our relationships, make sure that the Indigenous arts community knew we were keeping the doors open, having an opportunity to meet people, to have one-on-one discussions and sometimes group discussions about what’s happening….There was a lot of building of relationships and recognizing of relationships,” she said. Part of that “investing” included helping with proposal writing, fundraising and sponsorships, and building skill by bringing together experienced Indigenous filmmakers with novice filmmakers. Now, with Dreamspeakers kicking off on Friday, the festival has grown from four days to six days and includes audience participation with workshops, panels and community dialogues liberally interspersed among the film viewing. Dreamspeakers is teaming up with the Provincial Archives of Alberta for a Gil Cardinal retrospective. It will be a combination of screening Cardinal’s films Totem and Foster Child, an archival display of Cardinal’s works, and a wall mural created by Jane Ash Poitras. “We’ve had to kind of stretch out to be responsive to both the Indigenous community and arts community and mainstream community … the whole community. 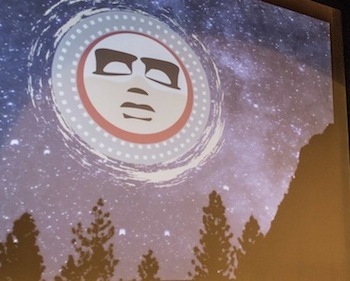 In general, we’re using different opportunities to intersect or connect with communities, the whole community, but also specifically with our Indigenous filmmakers and artists and craftmakers,” she said. Frederick encourages people to attend the entire festival, but if she had to highlight a few events she would pick opening night to help “fuel the rest of the festival;” the awards night, which will be enriched with performing artists; and the panel discussion following Cardinal’s film Foster Child, which will examine the role film and art play in social and political issues. “It’s an opportunity to look at what has happened since the film was released in 1987. How do we as a community support the work that artists are doing and when they are involved in big, grand, sweeping gestures of artistry and they create these expedited political movements, how do we prepare the comm for those kinds of changes,” said Frederick. Another connection Dreamspeakers has made is with the University of Alberta. Closing night, another highlight noted by Frederick, will include the inaugural event of the university’s Indigenous film series, Angry Inuk, as well as a panel discussion on reconciliation. In 1993, Dreamspeakers was one of two Indigenous film festivals in the world, the other being in San Francisco. Now, there are over 40 Indigenous film festivals world-wide. Dreamspeakers International Indigenous Film Festival runs from Sept. 23 to Sept. 28 at Metro Cinema in Edmonton. Back from a year off, Dreamspeakers International Indigenous Film Festival offers six days of thought-provoking entertainment and discussion.